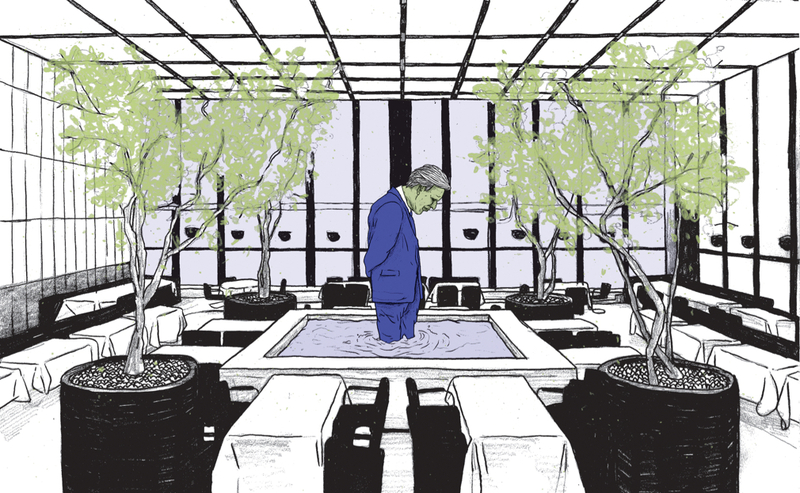 How does a decadent darling on the chopping block become an unlikely underdog: the famous restaurant in New York's Seagram Building and its mandatory hip makeover. Entering the Four Seasons Restaurant in the Seagram Building in Midtown Manhattan, there is a sense of that golden shimmer which feels both delicate and powerful. It is the string of a starlight bow pulled from the fully formed elegant rage of a Goddess. It is the precise tailoring of a tasteful blue trouser. It’s money. It’s power. It also feels, deeply, strongly, defiantly unhip. At a time in which any restaurant worth its salt in New York is looking for a found-driftwood copper-kettle twee interior design pallet, the Four Seasons is as it ever was, a place for suits. One does not have “a rip-roaring-good-time” at the Four Seasons. One has a lovely meal with someone fancy, probably named Jeremy, who just finished a lecture tour before meeting a client to discuss downsizing. Therefore it’s incredibly ironic that a place that is, and always has been, the physical embodiment of elite power finds itself as an underdog darling on the chopping block. Because the Four Seasons as we know it is coming to an end. Being kicked out of its building in a political and financial coup that many New Yorkers have seen as a certain kind of balance shift in the area, if not the city as a whole. However, the most intriguing aspect of this shift, is not necessarily the tactics surrounding it. Instead it’s the Don Draper-like nostalgia which has kept the restaurant’s space traditional for so long. The particular fascination showing just how impossible it is to give up those emotions in favor of something that will survive. The last season for this restaurant might prove to be a swan song to a certain kind of power aesthetic. One we watch as observers and, for those rich enough, diners. Architecture students worldwide can usually identify the Seagram Building fairly easily. A tall, black monolith intended as a love letter to regularity and precision. Exposed metal beams fighting a world filled with chaos. Or, alternatively, a gloomy hulk that sits like a miserable, miserly tyrant. Whichever way you take it: it’s hard not to see the building as a masterpiece. The Seagram Building defines the aesthetics of an era with a sleek profile and a brooding, determined self-possession that is so admired in anti-heros. This look, it should be said, became definitive in the careers of both Philip Johnson and Mies Van Der Rohe. As a company, Seagram prided itself on a legacy of consistency. Before closing up shop in 2000, Seagram as a company made, among other things, Gin. In the 1920s, when many of their competitors were turning out various qualities of prohibition era bathtub hooch (that may or may not have caused liver disease and blindness) Seagram’s could be trusted. Regularity, precision, integrity. The architecture of their New York headquarters, both inside and out, reflects that notion, with a little extra poetry thrown in for luck. When the building was constructed in the late 1950s, the philosophy made its way to the restaurant. The design is composed of two 60’ by 60’ cubes with 20’ high ceilings throughout. One room, the Pool Room, was once referred to by Jacqueline Kennedy Onassis as “The Cathedral”. Huge glass windows dominate the modular space almost as much as the trees that guard the water. It was in this room that the painter Mark Rothko was commissioned to create a series of images to match the mood of the architecture. Rothko, quite the contrarian, found all the money and greed that the architecture represented appalling and decided to paint death murals to take away the appetite of the powerful. Ultimately, he decided not to bring his paintings into the Four Seasons as an act of artistic defiance against not only the restaurant, the building, its owners and the patrons, but the concept of power itself. On the other side of the restaurant, through a tall marble passageway, is the Grill Room. This room is essentially a bar with a seating area whose peak hours appear to be around lunchtime. The Grill Room in particular still has the distinct whiff of the 1980s. You get the feeling here that you might bump into a slicked back Michael Douglas poised to lecture you on how morality gets in the way of business. What business? It doesn’t really matter. But all that was due to change. The writing on the wall started to reveal itself in 2014. Or rather, the canvas on the wall. Specifically an enormous canvas painting Picasso produced for the Ballet Russe in 1919. When it was hung in the Four Seasons, “Tricorne” was the largest Picasso in the United States, despite being cut from it’s even larger original size. As the New York Historical Society (NYHS) states, Vivendi, the company that owned the Seagram Building, as lead by Aby Rosen, gave the Picasso curtain to them in 2015 as a “Gift to the City.” It should be noted, that just a year before, the Landmarks Conservatory (another historically-minded group) sued the building’s owner when they found out management intended to move the painting to make repairs to the wall behind it. Management determined the work was necessary for a building that was almost 60 years old, but the Landmarks Conservatory saw this as a ploy for a piecemeal break-up of the building’s aesthetic. The conversation that followed was one that started as a property management concern and soon became an art crusade. Even if “Tricorne” was deemed by one observer as “A Second-Rate Picasso” it became their grim portent of things to come. After quite a bit of legal wrangling, the painting is now in the hands of the NYHS, and not, it is to be noted, the Landmarks Conservatory. For their part, the Landmarks Conservatory saw this movement as the first step in a slippery slope that would lead directly to the destruction of the Four Seasons. They had a legitimate reason for concern, based on precedent, after they had watched the Four Seasons’ peers go the same way. For over 50 years, the Four Seasons was on a par with both the Plaza Hotel and the Rainbow Room. These three were the restaurants in which one could see and be seen. But the latter two each went through a massive change in the past few decades in order to survive. After a liquidation sale in 2005, the Plaza now caters to a wide variety of people, with a concourse in the basement that serves reasonably priced drinks and sandwiches for a more general public, and not just the ladies at high tea in the lobby. For its part, the Rainbow Room closed following the financial crisis and then underwent massive renovations to keep itself afloat. Though their prices remained more or less the same, they restricted the reservations to Sunday Brunch and Monday Dinner only, keeping the restaurant otherwise available for private events at all other days and times. Making these places more or less accessible to everyone is a much more democratic, and quite frankly, less obnoxious means of staying lucrative. Additionally, it’s hard to feel sorry for a place that has been the center of elitism for the better part of a century. And yet, people still have an attachment to the Four Seasons. Maybe it’s the history, maybe it’s the nostalgia, but more than likely, it’s just, for lack of a better word, a beautiful space. One that did not need to change for a very long time (particularly in the dining world).The Four Seasons has weathered those storms. But it may now be out of luck. So why exactly is the Four Seasons in trouble? Like many New Yorkers who have been priced out of their beautiful apartments, their lease is up. In the Summer of 2016, the owner of the Seagram Building, Aby J. Rosen will be replacing the current restaurant with a new one, featuring a team of young chefs, all in their 30s. The intent being that they will, according to the New York Times, “Restore and reinvigorate the greatest restaurant space that’s ever existed,” adding that their restaurant will not be called the Four Seasons; a new name has yet to be chosen. The parties who have kept the Four Seasons running, Alex von Bidder and Julian Niccolini, have apparently been searching for new locations as their lease is expiring but have not made any grand announcements as of Fall 2015. Fortunately, it’s recently been clarified that the architectural space is finally, safe. Through the machinations of the Landmarks Conservancy and other civic organizations, the “greatest restaurant space that has ever existed” is only going to go through minor renovations when the new restaurant switches over. The Picasso fiasco drew the restaurant to the public’s attention, attracting fear that an iconic member of the American Architectural pantheon was soon to be dethroned. Though from a business perspective the course was clear, the powerful do not stay powerful forever and hearty eaters and drinkers may, in their older years, decide salad is enough. In their most recent write-up, the incoming restaurant states that they want to restore the glory of the old restaurant. What that means is unclear, but the owners are now in a difficult bind. A bind that was tested in May 2015, when Aby Rosen went to the courts with plans for renovations only to have his plans dismissed. Regardless as to whether the owner is indeed the callous and “capricious” landlord that he has been made out to be, the ruling is a bittersweet victory for those who are fighting to keep the Four Seasons the same. Through years of work and pressure they may have created a beautiful, museum-quality shell that is for looking only. Indeed, the fact that the space stays while the restaurant goes is bringing up questions as to whether the Four Seasons is really as timeless as is claimed or if it’s a hothouse flower that can only thrive in a certain environment. Even cynical architects may have a soft spot for a business that is so deeply dependant on the design that surrounds it. Furthermore, Midtown New York, like many international cities, is changing rapidly. Some have decried that a huge chunk of Manhattan is now unlivable with sky-high rents and the almost methodical removal of anything regional. Meaning that, if not even the “Four Flippin’ Seasons” can survive, what hope is there for the rest of us? The hard-fought landmark status of the Four Seasons restaurant presents an interesting conundrum for anyone moving into it. Almost like a hermit crab into the fanciest and most cumbersome shell, some adjustment is necessary and they will either grow to fit the space or die. That said, the design won’t change (at least not significantly), and neither will the purpose of the space, so do the humans in it really matter? Switching rich clientèle for other rich clientèle doesn’t really make a difference so long as the money continues to flow. This case is characteristic of architecture’s excessive concern for the balance of past and future. It is one which eventually came to dominate architectural theory through the lens of American postmodernism. The tendency involves imagining a past that never happened and a future that couldn’t possibly be reasonable and ultimately making a product that is not quite as good as either. All this is not to say historical preservation is just a symptom of nostalgia, without it, a building just becomes a box that either makes money or doesn’t. And it is important to save some keepsakes for the next generation, even if wistfulness does not always make for great architecture. Mind you, for most of its previous career, the Four Seasons was undeniably a box that made money. It even still does make money. A lot of money. With $24 whiskeys, how could it not? But slowly, over the course of time, like a kind of gilded mid-century modern King Lear it has been left as a testament of things that were once grand. What remains to be seen is whether the name is what was most important, the atmosphere, or maybe, shock of shocks, the food. Who Determines the Future of the Past?